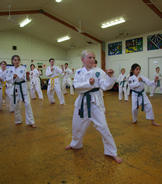 Training in the Art of Taekwon-Do is long term commitment for any student. 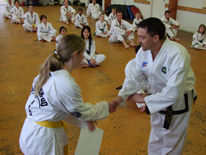 Advancing through the belts is done by a system of gradings. Gradings are held every 4 months. A grading consists of line work, patterns, theory, and for higher grades, sparring. Students can advance through the belts at a rate of 1 Gup every 4 months, until they reach black tag, at which point the student must wait 60 hours of training since thier last grading. Reaching Black Belt can take as little as 4 years, assuming the student advances as fast as possible and does not fail any gradings. However, treating Taekwon-Do as just a bought commodity that allows the student to gain a Black Belt is frowned upon, and will not be tolerated. This is reflected in higher level gradings, where students may be asked how they have contributed to their school aside from working on their own advancement (contributions include teaching lower level students, helping at gradings and helping at tournaments).